Most large retailers post their Black Friday ad scans, coupons and offers online beforehand to give consumers time to find out about sales and plan their purchases. 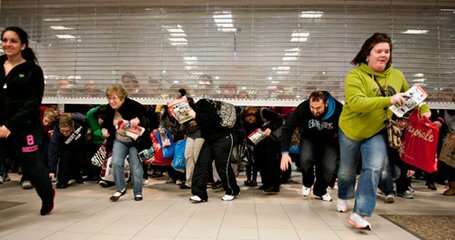 Other companies take a different approach, waiting until the last possible moment to release their Black Friday ads, hoping to create a buzz and keep customers eagerly checking back for an announcement. More and more, consumers are choosing to shop online, not wanting to wait outside in the early morning chill with a crush of other shoppers or battle over the last most-wanted item. Often, many people show up for a small number of limited-time “door-buster” deals, such as large flat-screen televisions or laptops for a few hundred dollars. Since these coveted items sell out quickly, quite a few shoppers leave the store empty handed. The benefit of online shopping is that you will know right away if the MP3 player you want is out of stock, and can easily find another one without having to travel from store to store. Also, many online retailers have pre-Black Friday or special Thanksgiving sales, so you may not even have to wait until the big day to save. In 2017, 11% of Black Friday shoppers started shopping before 5 p.m. on Thanksgiving Day. Another 11% began at 6 p.m. And another 25% started at 10 a.m. or later on Black Friday itself. Heading into the 2017 holiday season, 69% of shoppers said they planned to shop on Black Friday, and 49% said they planned to shop on Thanksgiving. These are some information about the Black Friday, help it can help you to understand, and at te same time, when we buy something cheap, we can also think about it we really need it, keep a rational consumption.